Good muscle tone is the foundation of a more youthful appearance and a firm well-shaped body is simply not possible without it. However, posture is another factor that plays a huge role in how we look and how well-shaped our body is but it is often overlooked by fitness advisers and seekers alike. 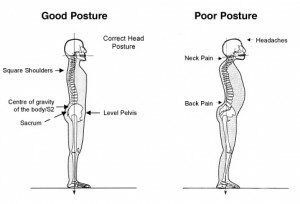 In fact, posture is as important as the right diet, challenging exercise and getting a good night’s sleep. It definitely ranks at the top of the list when you are talking about good health. Unfortunately most people have developed such poor posture habits by the time they turn 50 that their bodies have even forgotten where things should be. The primary cause of poor posture is weak “core” muscles caused from years of sitting in a hunched position but it’s not the only cause. 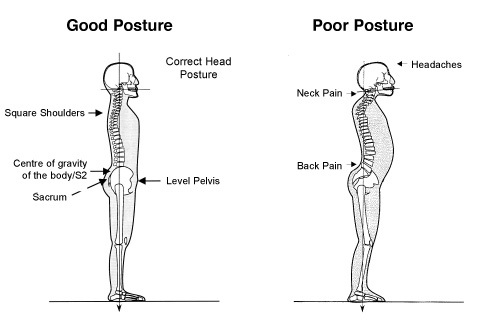 Poor posture can result from environmental factors and bad habits. As we get age the head and shoulders has a tendency to shift forward, the chest curls inwards while the spine crunches from a healthy S-curve to a less healthy C-position as the pelvis tips forward. When this happens, undue pressure is placed on the discs (the cushioning pads) between the bones of the lower back which in time causes them to become compressed and painful. Avoiding challenging exercise in lieu of sitting for long periods of time each day is the perfect equation for back, neck and hip pain that just gets worse as time goes by. A strong skeleton sporting strong muscles holding everything firmly upright means the muscles, joints, ligaments and tendons that allow us to move freely are all in their correct positions. This places the correct loading on the structures that are designed for it rather than areas that are not. A good level of strength in the body’s muscles is needed so they can properly dominate the skeleton and demand that leg, hip, and back bones stand at attention and protects the spinal column. This keeps the body weight from weighing down on the vertebrae compressing and squashing the fragile spinal discs. The natural pull of gravity coupled with the loss of muscle strength transitions the body into a slouched unhealthy shape and although it may seem as though stooped posture is the result of old age, you can prevent the all-too-common rounding of the spine (the result of osteoporosis and the destruction of the vertebrae in the upper and middle spine). Bad posture not only presents an ugly and unbalanced appearance, but it is just plain dangerous to your health and according to some experts even affects your ability to think positive. Without a doubt, the most positive step you can take to correct bad posture is to develop strong muscles through strength training and flexibility exercises. Strong muscles give your body the edge, you move naturally, feel good and look great. Healthy, correct posture allows the body to function at its maximum potential due to no interference with the body’s many systems. And, for those searching for the best anti-aging tactics, good posture does more to keep you looking youthful than any face-lift could ever do. Proper posture, range of motion and spinal flexibility all contribute to longevity and quality of life. If you are serious about achieving a truly healthy lifestyle visit “Carolyn Hansen Fitness.” All my products support a whole body approach that supports both the body and the mind. Let me help you achieve the health and fitness in body and mind.